← Starting Big School 2016! •Try getting back into a routine with sleep times, bath times, meal times and other regular activities at least one week before school resumes. This will help your children’s body clocks adjust to the rhythm of routine and make the transition less stressful. •Get them to have a look at their calendar/planner (as suggested in Help your child achieve their dreams for 2015!). They can use it to count down the days until school begins so that they have comfort in knowing when and what will take place. They can also use it to get organised for the next week. •Help them to get excited about the impending term by talking about what is coming up e.g. excursions, parties, swimming lessons, Easter, and seeing all their friends, etc and then demonstrate how to mark some of these on their calendar/planner. 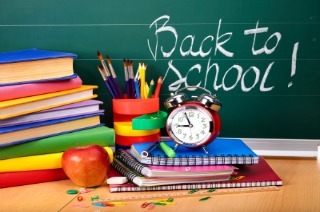 •Make the first week back relaxing and try not to plan too many after school activities if possible. Getting back into a routine is tiring and it’s best to keep all other activities to a minimum. •Give them lots of free time after school to just run outside, play and be free. Especially the first week back but as often as possible during the whole term as well. •Plan something fun but simple for the first weekend after being back at school. It could be a movie or pizza night, a picnic in the park, or a visit with family and friends. This is something the children can look forward to if they are hesitant about going back to school and it lets them know that the fun doesn’t have to end just because the holidays do. •Hopefully there will be no homework in the first week back (if they attend a school which believes in giving homework) but if there is, show them how to organise their week so that they can do a little at a time and it’s not overwhelming. They can use their planner to work out when best suits them. •Make time at dinner to sit around the table together (which should be a regular occurrence anyway) and chat about their day. This helps them to communicate their feelings and bond with their family. If open communication is developed and encouraged then they will be more likely to open up to you when they have concerns or issues that they need to discuss. •If they are at a new school or even just a new class with different students and teacher, they may be feeling a little anxious about the change. Ask them how they are feeling about the new school/teacher/class and answer all their concerns as honestly and reassuringly as you can. More than anything just be there for your children to guide them through this change in routine as there may be a period of adjustment which might cause them to feel anxious. You may notice behaviour that is not typical for them and it could just be that they are overwhelmed and overtired with the changes. Be understanding and talk to them about their feelings. It may appear that they are just being “naughty” and playing up, but there is always an underlying reason so make sure that you investigate and be supportive. In saying all of this, your child may actually be really happy about being back at school and not have any worries or concerns at all. If they are, then that’s great but just keep these tips in mind so that you can ease them back in regardless of how you think they will – or how they do – adjust to this big change.